En route to Wahoo Gullies in the Bishop zone. Buttermilk road ends and the trek continues along the dirt road until you hit the snow. On Tuesday, the Department of Water Resources measured the Sierra Nevada snowpack at 161% of average, the fourth best reading in 40 years. This is good news as it relates to California’s water supply, but before that snowpack melts out, we plan to ski it! Skiing in April and May is our reward for enduring winter’s heavy storms. When winters blanket begins to melt and freeze, day after day, it turns to what‘s called corn and skiing corn is undoubtedly the second best type of snow behind powder. It’s soft and forgiving, yet fast. Plus you can ski in sunglasses and t-shirts, and it’s still light out when you’re done. If you don’t like spring skiing, you’re probably doing it wrong. Spring skiing in the backcountry is like a dance; timing is everything. Ski a slope too early and it’s hard and icy, wait too long and hit it late, it’s sticky and soft. In the North Tahoe area, look at east facing slopes for dawn patrol, south-facing slopes in the morning and west facing slopes in the afternoon. If you’re lucky, you can spend a day linking it all together. After ticking off the Tahoe classics (our favorite is the Nat Geo zone behind Squaw Valley), look to the eastern Sierra, where the mountains hit 14,000’! The added elevation and expansiveness of the mountains let us keep searching for snow well into spring. From Tahoe, the “East Side” is only a few hours’ drive, and you can spend our weekends sleeping in the dirt, skiing all day and recovering in the hot springs at night. South view from the top of Esha Peak in the McGee Creek zone. 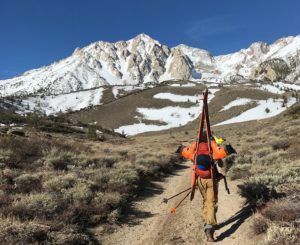 Last spring I made multiple trips down to the eastern Sierra, ticking off Wahoo Gullies in the Bishop zone, Esha Peak in McGee Creek zone and South Peak in the Virginia Lakes zone. All perfect objectives for those looking to step beyond Tahoe and ski 3,000’ of perfect corn! I was also lucky enough to be in Lee Vining the day Cal Trans opened Tioga Pass to the upper gate. Mt. 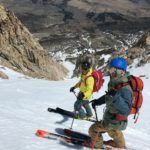 Dana and the Dana Plateau have some of the most spectacular couloir skiing in Eastern Sierra, and when Cal Trans opens the lower gate, backcountry skiers and riders can team up, park a vehicle at Ellery Lake and continue on to the pass. Parking a vehicle at the top allows you to head up the northwest ridge of Mt. Dana. This shuttle opens the door for classic linkups such as The Dana Couloir to Ellery Bowl, Solstice Couloir to Chute Out, and Unknown Chute to Banana Chute. As the days get warmer here in Tahoe, I’m building my tick list and looking at my calendar, eager to get back down to the Eastern Sierra. Call the office to book your day(s) in the Eastern Sierra. Our AMGA trained guides would love to show you their favorite zones, and explore new ones with you. From Lee Vining to Bishop, there are a lifetime of lines to ski. Time to harvest the corn! For information on any of our other expeditions check out our website. For any questions call our office at 877-873-5376 or send us an email info@alpenglowexpeditions.com. We hope to ski & ride with you soon!